Dugderan comes from the onomaetopia ‘Dug’ and ‘Der’. ‘Dug’ comes from the sound of Mosque drum, drummed many times as a sign of the start of Ramadhan and ‘der’ comes from the sound of mosque cannon, fired alongside the sound of the drum. This tradition comes from the city of Semarang, Central Java. The tradition has be done for hundreds of years and still going strong until now. It is usually done one or two weeks before the start of Ramadhan, and joined by Zapin dance, carnival, until Mosque drumming competition with prizes from the Mayor of Semarang, becoming an all-out celebration. The sound of the cannon is sometimes being replaced by the sound of firecrackers made from hollow tree-trunk filled by carbide then being ignited, named as bleduran. Nyekar, or visiting the tomb of the ancestors, actually can be done around the year. Before the fasting month come though, it is almost a tradition to do it, although the tradition is not supported by some scholars. Nyekar is done to make the living remember about death and afterlife, to do their best when they are alive. Comes from Aceh, meugang is a tradition of slaughtering Cattles one or two days before the start of Ramadhan. Because of this, meat is almost a staple food in the first days of Ramadhan. Further read about meugang can be found in previous blog correspondence here. Munggahan which comes from the word unggah, means moving upward, is a tradition done in Sundanese one day before ramadhan. The meaning of the tradition is to be more devout individual before doing the fast. Munggahan can be done in many ways, eating lunch with family, reciting the Quran together with the neighbourhood, as long as the objection of family gathering is reached. 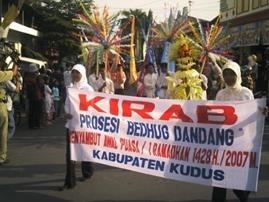 Dandangan is a night market held to celebration the fasting month from the city of Kudus, Central Java. The night market is held in the vicinity of Kudus Tower, along Sunan Kudus Road. The tradition was first started by the Sunaan of Kudus, prominent figure in the spreading of Islam in Java. His students, coming from many region in the island, will gather in front of the tower to wait the announcement of the start of fasting month by the Sunaan. This, resulted in crowd, a good opportunity for sellers of household items until toys. Wrapped rice, shredded coconut with meat (serundeng), and a kind of vegetable soup with meat named sayur becek (literal: muddy soup)’s position in the menu for perlon unggahan is fixed already. Other than the three food, a feast will be held in Banyumas Regency, Central Java for the entire neighbourhood. The shredded coconut and sayur becek have to be prepared by exactly 12 men. 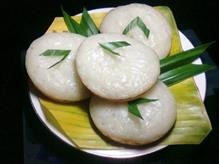 Apem, or in English Apam, a snack made with coconut and rice flour, is a must in the start of Ramadhan in the city of Surabaya. The name Apem is believed to come from the Arabic word Afwan, means sorry. Symbolically, the snack then translated as apologizing to our family and friends by eating it together. After the ceremony, people then do the handshaking with one another as one mean to apologize. This bathing ritual symbolizing the purification of health and mind is widely done in Klaten, Boyolali, Salatiga and Yogyakarta. Dipping and swimming together at the spring are a part of the celebration. In Regency of Kalianda, Southern Lampung, there is similar bathing tradition named Ngelop. The difference between Ngelop and other bathing ritual, is that it is not being done in river or lake, but in the sea. Ngelop is usually done in Ketang Kalianda beach in the evening until sunset in the day before the start of Ramadhan. If Padusan is the term used in Java, in West Sumatra, there is similar tradition called Balimau. Although literally means washing, including hair, using lime, nowadays, people just do it with normal bathing equipment. 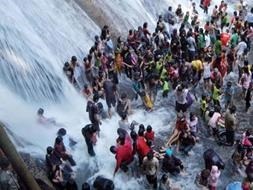 People will go to any body of water such as lake or river from the sunrise to sunset a day before Ramadhan is started. In Islam, cleanliness is very important and part of the belief. That is also the philosophy behind Balimau, other than socializing. In Riau, the celebration is a bit different than the others. Done before Ied, it simjlar to canoeing, done on the river, using traditional boats. This is a big celebration watched by a lot of people. 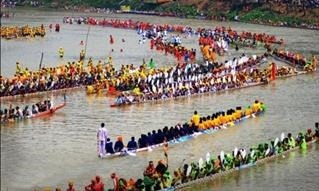 The tradition is named jalur pacu, means race track. Jalur pacu will be closed with Balimau Kasai, a tradition to purify oneself after sunset. 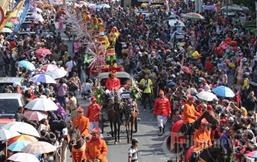 This tradition comes from Betawi, the recent name of Batavia, Jakarta. Nyorog means sharing food parcels with older family members: parents, in-laws, grandparents, and others, before Ramadhan. Usually the package is filled by fresh products, meat, coffee, milk, sugar, syrup, and other products. The tradition is being done to strengthen family bonds and also as commemoration of the start of month Ramadhan. How about your country? Is there any tradition done by the moslem to celebrate the fasting month? Posted on July 7, 2014, in Culturing and tagged aseankorea, culture, islam, ramadhan, tradition. Bookmark the permalink. Leave a comment.